This summer was a close repeat to the one that we had last year – cool, wet weather into the first part of July and then mild temperatures all summer. Unlike the rest of the country, we had very few hot days. Now we are trying to harvest everything all at once before either freezing temps or devastating rains zap us.. The result of these weather patterns is that the “early season” tomato varieties have been ripening in late August while the “mid and late season” varieties are ripening late in September and into October. Rain is not threatening – we actually have not had a drop since July and none is forecast in the near future – but the nights have been dipping into the low 30s for the past three days. The cold temps have been a season-ender for the vining crops, the corn and legumes are drying down nicely, and solanace family are all showing some degree of damage. This means that we are running a big crew (for us anyway) trying to bring in all of the tomato seed that we can before a “real” freeze or rain hits and turns everything to mush. 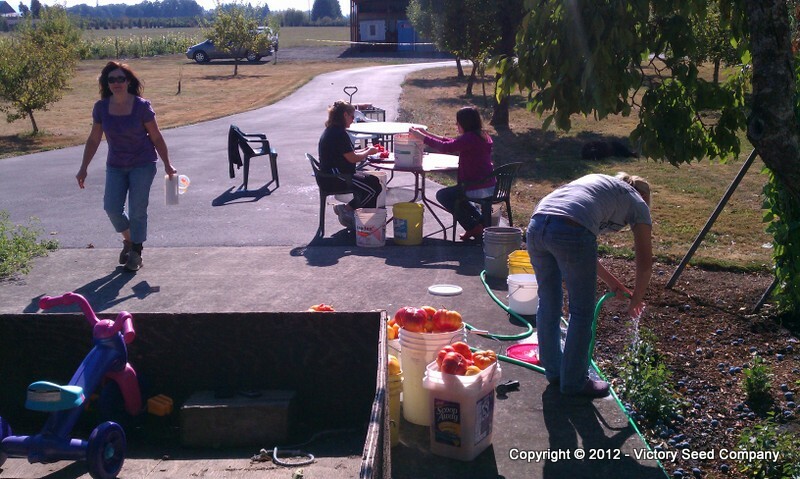 I thought that I would share a short pictorial of the tomato seed harvest process with you all. Harvesting tomato seeds obviously begins with picking the fruit. Only fully vine ripened tomatoes are processed for seed. Although we spend a lot of time with the plants throughout the growing season, we use this opportunity to document the flavor, textures, interesting characteristics, weights, sizes, and take photographs. 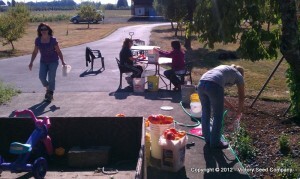 Once that is done, the buckets of tomatoes are given to the crew for processing. As you can see in the photo, this October here on the farm has been really nice. It has started light frosting overnight, but has been in the mid to high 70s during the day so we are able to do this messy work comfortably outside for a change. This is a photo of the crew squeezing tomatoes that John picked. During this seed removal stage, the crew only works with one variety and then cleans everything up before moving on to a new variety. Since the primary purpose of our work is preserving old varieties, accuracy is a key part of our mission. Starting with proven seed, our grow outs are carefully monitored throughout the season and compared to the historical record for the particular variety as well as to our past grow out data. 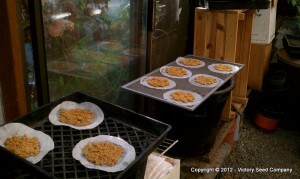 Neat, tidy and following procedure is critical during the seed saving stage. Those of you that have read my thoughts on the subject of repurposing or have watched the videos know that I am a big fan of keeping useful “trash” out of the the garbage stream and even out of the recycling bin. If you can find a new use for an old item, it is just plain smart. 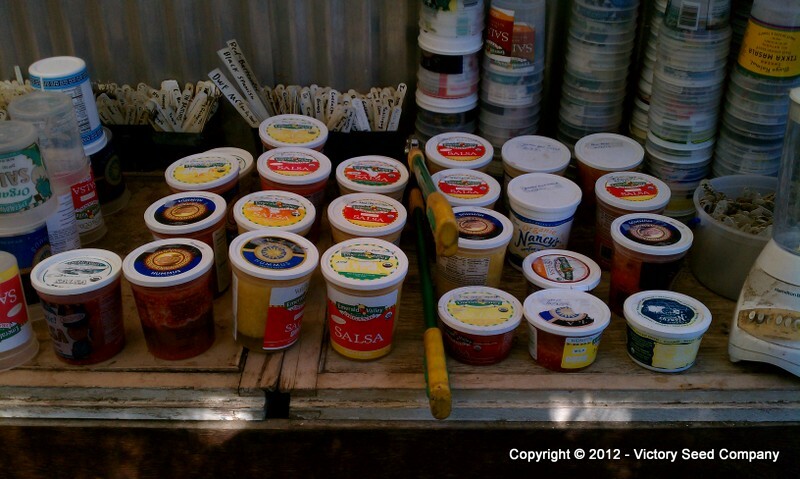 So in that vein, we have our friends and family save their plastic salsa, sour cream, and humus containers for us and use them for fermenting the tomato seed harvest. (FYI – The containers last four or five years but the lids only only about three) I have found that the perfect place on our farm for fermentation is in our potting shed. If the temperatures are just right, the seeds are ready to be washed in three days. Aren’t they pretty? This happens to be a nice batch of ‘Millet’s Dakota‘ seed. Folks have different methods for drying. My way of doing it is to place the wet seeds, about a cup of them, onto a paper coffee filter, gently wring out as much water as possible without tearing the filter, and then spread the ball of seeds out and allow them to dry. As a rule, I let them start the drying process in the potting shed that first day and move them into the barn that evening where I have fans going. And to prevent any possible disasters from happening, I keep different varieties far away from each other. All of the seeds in the above picture is the same variety. After about week, the clumps of seeds can be crumbled and screened to remove and small seeds and dust. And that is the process in a nutshell. If you are interested in more detail about how to save your own tomato seeds, click here. And as always, thank you for supporting our seed variety preservation work. We could not do this without you! It has again been some time since my last blog post. I often think about cool and interesting things to tell you about but it is usually when I am working out in the field or up to my elbows in fermenting tomato seed sludge. I can’t wait until we there is a direct brain to blog interface available. Until then, I suppose this will have to do. Let’s see . . . what’s new?!?! Well, once our summer finally arrived (about July 5th ), it ended up being one of the driest ones in years. Our installation of drip irrigation really paid off. With minimal effort, we kept everything in the field watered as needed and things have done very well. Although it was dry, the temperatures were very mild. This made it pleasant to work out in but has affected maturation on things like peppers, eggplants and tomatoes. If the weather holds out for a few more weeks, we should be fine but this is always the “nail biting” time of the year when an early frost can end up . . . well you get the idea. I don’t want to jinx it. 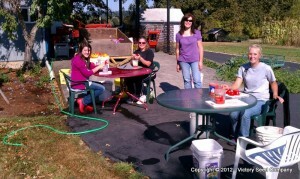 We have been busy harvesting peas, beans, cardoon, tomatoes, and ground cherries. If all goes well and germination tests prove positive, we should have a lot of those popular and currently out-of-stock varieties available once again for the 2013 gardening season. And speaking of ground cherries . . . I spent several hours yesterday and today processing five gallon buckets of ‘New Hanover‘ and ‘Cossack Pineapple‘ ground cherries that Melanie picked and de-husked (thank you Melanie). While fresh in my mind, I thought that I would share some seed saving tips. Basically I use a process very similar to the tomato process outlined by clicking here, with a couple of differences. Start with the ripest fruit (they drop from the plant when ready) that are a nice golden color. Then, as mentioned, they are removed from the husk. This is a tedious, manual process so if you have any tips, I would love to hear them. Then, instead of cutting and squeezing, I cheat and use an old Good-Will acquired, cheap, blender and using the pulse function, break the fruit up into a slurry. Don’t go overboard here or you might start damaging seeds. I pour the fruit-smoothie looking (and smelling) contents into a five gallon bucket stopping when half full (more on why in a sec), cover so fruit flies don’t find it, and place somewhere warm (I use a greenhouse or the potting shed). Unlike tomatoes, they do not need to be fermented for several days. Although they can be immediately processed, I usually wait 24 hours. I just have found that it is easier for me. 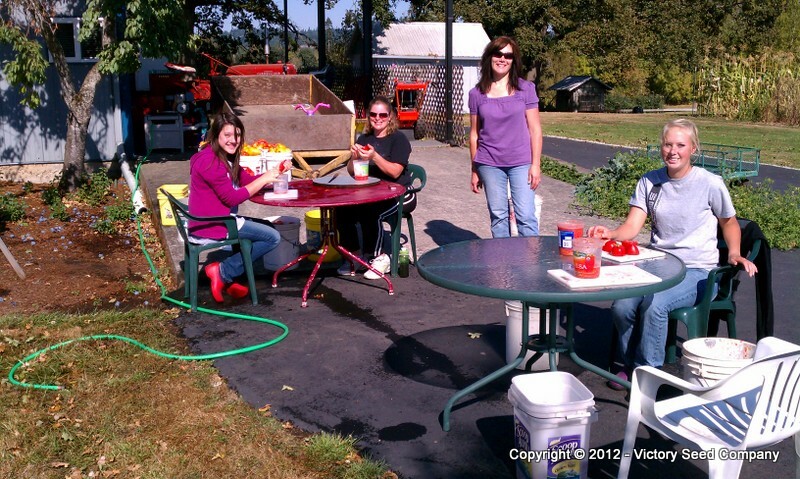 So, I pop the lid off of one of the half-full buckets and using a spray nozzle on the hose, fill the bucket to the brim. Give it a minute or two and the good seeds will settle to the bottom and you can pour off the bits of skin, flesh, juice and immature or hollow seeds. Fill the bucket with water again and repeat. Do this as many times as it takes you to get nice, clean seed. Some folks pour off through screens or strainers but for me, I prefer to dry them on coffee filters. Again, this is just my preference. 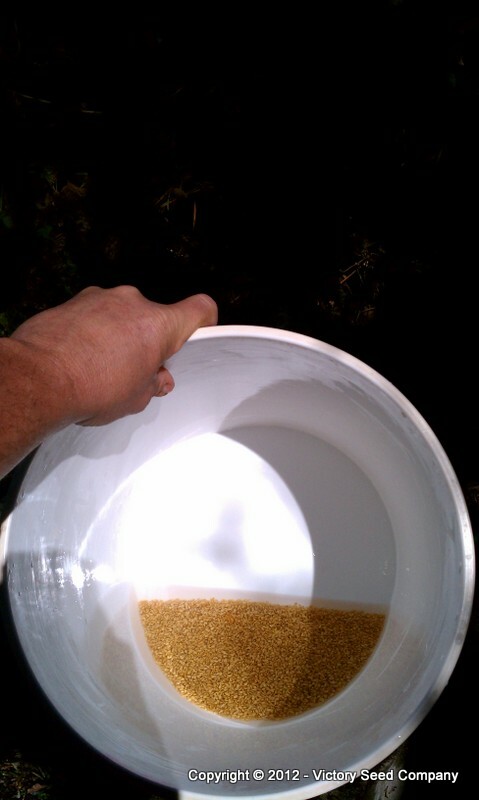 The main goal, like any wet seed processing, is to get the seeds cleaned and dried as quickly as possible. By placing small amounts into many coffee filters, I am able to get them in front of a fan in the barn and dried in no time. I also like handling the smaller amounts when getting the big, dried clumps of seed broken up and readied for sale. Anyway, this is what I did yesterday and today and although you probably won’t be growing out and processing several pounds of ground cherry seeds, you can scale down the process outlined above, using smaller containers for example, and save your own seeds. If not, I know where you can get some . . . and I already did all the hard work for you. Both ‘New Hanover‘ and ‘Cossack Pineapple‘ are currently out of stock, but if you are interested in receiving an email when they are ready, click on the links and click the “Put Me On The Waiting List” button. P.S. 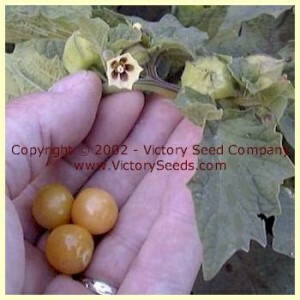 – If you are unfamiliar with ground cherries, click on the links above. They really are an interesting old garden staple that seemed to fall our of favor sometime in the 20th Century. I am not sure why. They are sweet and tasty, easy to grow, and the reward at harvest time is well worth the effort. I have added a couple of recipes to the the VintageVeggies.com recipe page . . . look towards the bottom under desserts. If you have any other old family recipes, or even memories and stories, please do share them. After a very crazy month or so, the weather folks are predicting our first hard freeze, a season ender, overnight tonight. We have done very well with the harvest this year. Considering how the weather was all summer, I certainly cannot complain. But we are still rushing around today. A couple of our school age cousins are coming after school and we will finish getting in everything that can’t freeze. Mainly it is just squash and pumpkins that are still out in the field. This is the time of year when all of the buildings are packed with seed waiting to be cleaned. Once that is completed, they are germination tested and assuming all is well, packaged. This is what we are in the midst of right now. We hope to be switched over to “Packed for 2012″ labeling by the middle of next month. My Dad is spending most of his time these days shelling and cleaning beans. 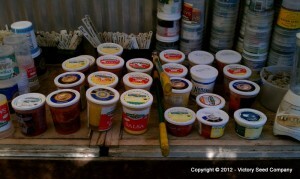 His time is definitely appreciated as we would not be able to get them ready for sale for months and months without it. He has done this for us for many years now and I think I about have him overwhelmed. With the new tractor and tiller and the new trellising system, we planted about four times the row feet that we normally do. My thought was that if we weren’t able to harvest all of the crop do to rain and temperatures at the end of the season (typical here), we would at least have one or two good pickings resulting in a decent inventory. Well, with the mild summer, a crew of two people dedicated to weeding and watering all summer, and a hot end of summer in September, we got multiple pickings to the point that we were able to pick the vines and bushes clean! Excellent But, not for Dad. He isn’t getting any younger and if I am going to keep increasing the size of our grow outs, I have to mechanize. Now that I have a shop, I hope to experiment with various leaf shredder to thresher conversion designs. Hopefully I can come up with one that shells the beans without damaging too many seeds. Not a lot else new here . 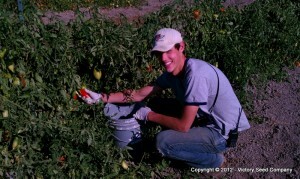 . . we are all in the harvest, seed cleaning, testing, packaging and otherwise preparing for the 2012 garden season. I hope that you all are enjoying fall. My lunchtime is done and it is back out to the fields for me.